This weekend I went to London with my lovely friend Lauren and we found some fantastic gluten free places to eat – and ones which (mostly!) won’t ruin the diet either! Last year I wrote a gluten free guide to London (which you can read here) and this trip we visited some of the places on my list – including Honest Burgers, Cookies and Scream and Whole Foods Market. Part of the trip was to show each other all of the amazing places we keep reading about on social media, and see what else we could find! So if you’re on a trip to London and you’re after some gluten free goodies (also most are dairy free, wheat free, raw foods or vegan!) then here are some tasty ideas to keep you going. But first let’s start with the not so healthy option I was SO excited to visit – a gluten free bakery!! Yes, that’s right, a wholly gluten free bakery! I read about Beyond Bread of Gluten Free Cuppa Tea (see post here) and despite planning a healthy trip this absolutely NEEDED to be first on the list of places to visit! Walking into Beyond Bread is a very strange experience for a coeliac. Usually, I avoid bakeries like the plague, so to walk into one where I could eat EVERYTHING just felt so… wrong. Until I started to realise just how much food there was! So much gluten free bread at this 100% gluten free bakery! Fresh French sticks, rolls bursting with fillings, slabs of cheesecake, brownies, muffins and, most exciting of all, pastries. Gluten free pastries!! There was no contest – for years I have drooled over how amazing pastries looked so I simply had to try one. Lauren and I decided to share, and I also opted for a matcha latte. I have always wanted to try one as I like matcha tea anyway, and I can attest it does live up to expectations. Gluten free choc chip and custard Danish from Beyond Bread in London. The pastry was incredible – just as I imagined. A custard and chocolate chip Danish, it was perfectly sticky with a hint of flake – Lauren agreed, as my gluten eating friend, that it was a close match to the real thing. You can find Beyond Bread at Charlotte Place in Soho, or at www.beyondbread.co.uk. I never even knew about Neal’s Yard, but what a fantastic place! And within it, looking out over the cute courtyard is Wild Food Cafe. Wild Food Cafe specialises in raw food, and is largely gluten free. It was one of Lauren’s top choices of places to go, and the queue when we initially turned up obviously spoke wonders about its popularity! We popped back when it was a bit quieter, but having just stuffed ourselves at Honest Burgers we were feeling pretty full. We couldn’t pass it by, so we decided to share a raw dessert. 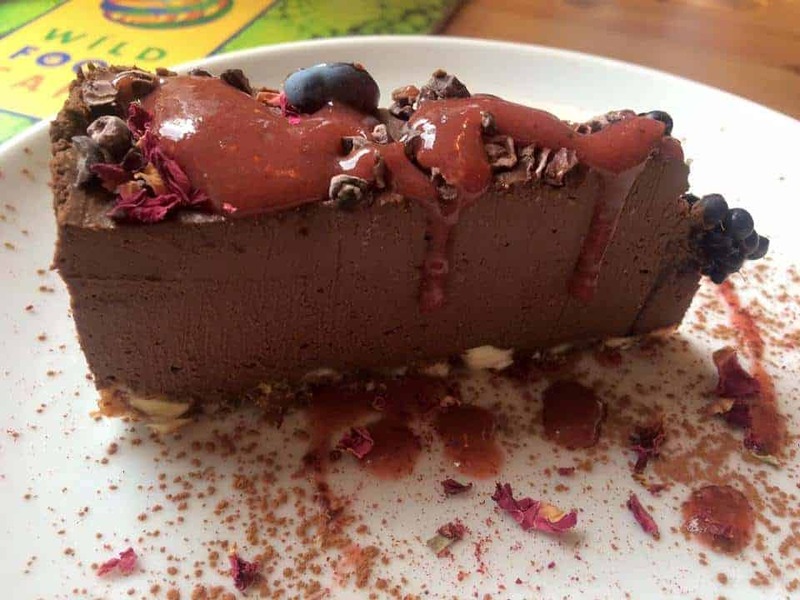 Raw chocolate tart at Wild Food Cafe. There were plenty of tasty looking treats on the menu but we went for the raw chocolate tart. And I tell you what, if you’re sceptical of anything ‘raw’ or ‘too healthy’, don’t be – this was bloody amazing. With a rich – but not sickly at all – flavour and a bit of crunch from the nuts in the base, this was delicious. It was a pretty generous portion, and I’d definitely like to go back to Wild Food Cafe next time I’m around to try their other offerings! You can find Wild Food Cafe in Neal’s Yard near Covent Garden, or at wildfoodcafe.com. The Good Life Eatery was literally right opposite the apartment we were renting for the night – so it was the perfect spot to roll out of bed and into for breakfast! It was a bit different from the usual fry up I crave on a Sunday, but I was intrigued. This cute little cafe has a fresh and funky feel, serving a wide range of breakfast and lunch options as well as a selection of raw and ‘healthy’ cakes. It also serves coffee and many different teas and smoothies. There is gluten free bread on request (£1 extra though, which I did not like!) and so I opted for the ‘skinny benedict’ for my brekkie. I decided to not order the paleo waffles, despite being tempted! My ‘skinny benedict’ at The Good Life Eatery. The ‘skinny benedict’ was a slice of gluten free toast topped with avocado, pesto tomatoes, poached eggs and a yoghurt saffron sauce. It was very tasty and a good combination of flavours, though the sauce was cold which surprised me. Otherwise, it was yummy and next time I shall definitely be opting for the waffles! Find The Good Life Eatery in Sloane Avenue or at www.goodlifeeatery.com. Feed Me Primal at Camden Lock. On Sunday I was on a mission – we arrived at a very busy Camden to try and find a stall I had read about called Feed Me Primal. Being paleo, it was completely gluten free and sounded great. I was about to give up when I got distracted by a sign saying ‘GLUTEN FREE’ – and followed it only to find it was Feed Me Primal! The food on offer was these amazing tapioca wraps – it was incredible to watch the man sieve the flower onto the hot plate and magically turn into a wrap. I had mine with pulled chicken, cheese, peppers, basil, coriander and salad and it was fantastic. The wrap had a great texture – it reminded me a little of Isabel’s pizza base as I know that also uses tapioca. I was seriously impressed with this wrap, and can’t wait to see what they have on offer next time I am down! With my almond milk latte! On our way to avoid the shops, we stumbled across Vantra – a quirky looking cafe/restaurant in Oxford Street. It looked amazing and was filled to the brim with tasty looking meals you can serve yourself and pay for by weight. Most were vegetarian and all clearly labelled as to what was in them. I was most excited, however (as we did not eat there) to find they did the one thing I had been hoping to find in London – and almond milk latte. Those who read my blog will know I love coffee, but as I am trying to cut down considerably on dairy it means I’ve had to wave goodbye to my beloved lattes and cappuccinos. However, I was very excited to finally be able to try this dairy free alternative. It was as good as I had hoped and it’s definitely a place I’d like to go back to eat at. Find Vantra at Oxford Street or at http://vantra.co.uk. While that covers the main places we went, there were a few other places I have mentioned or reviewed previously that we went to. These were…. 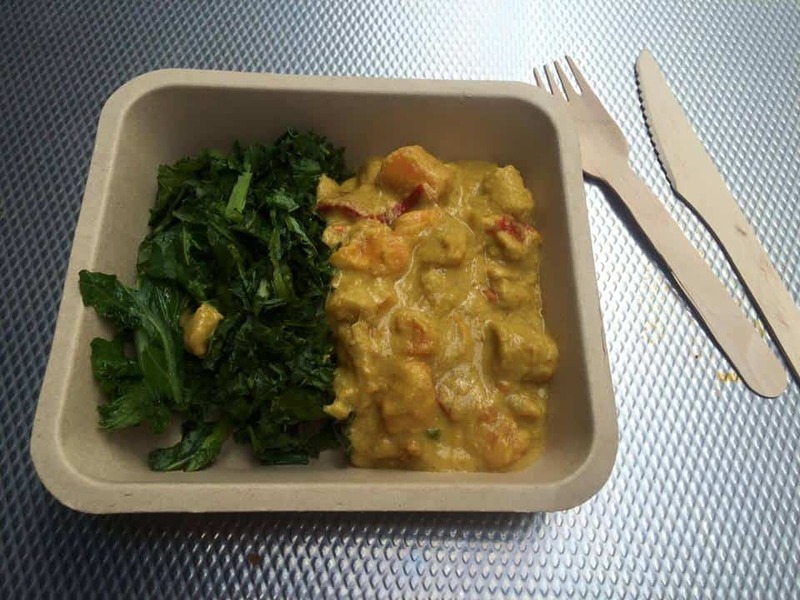 This time we grabbed gluten free Thai chicken curries and kale on the go – yum! 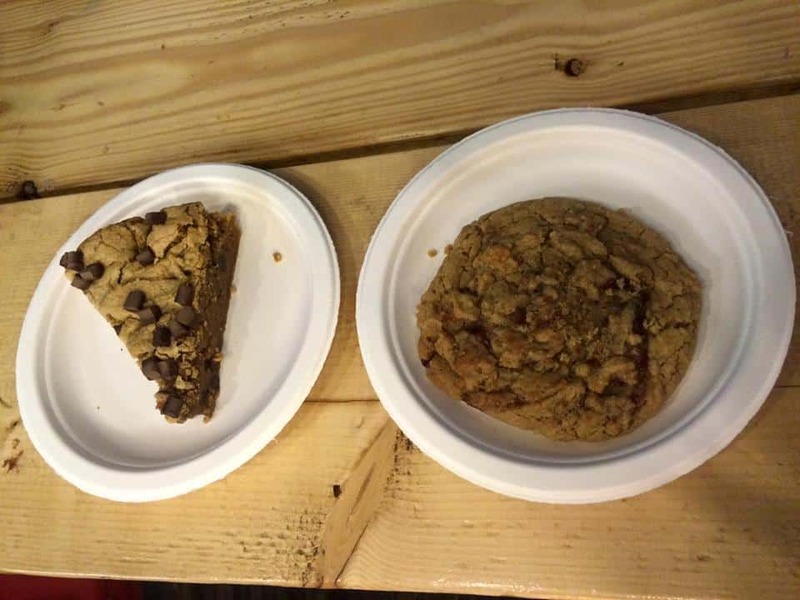 Gluten free and vegan, we had a peanut butter and jelly cookie and a chico pie which was amazing. 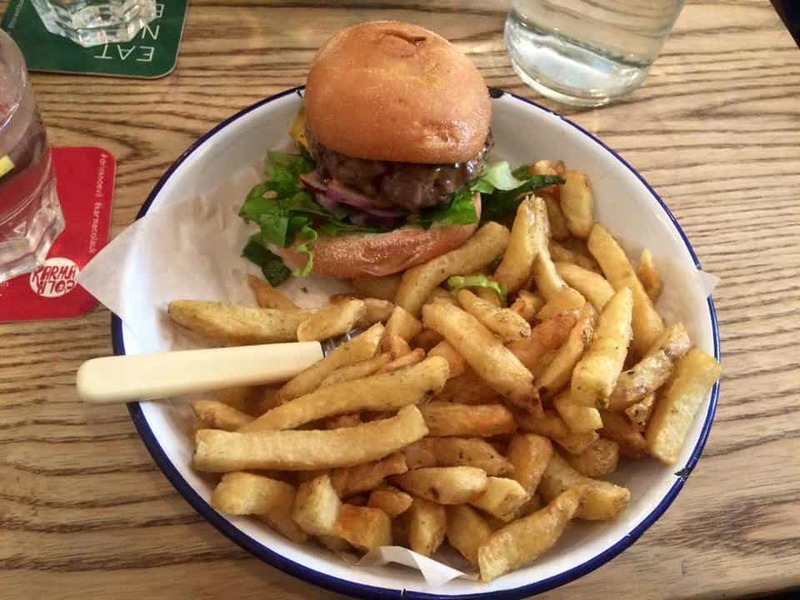 A good simple menu and very coeliac friendly – their rosemary salted fries are to die for! You can find out more about these gluten free places – and others – in my gluten free guide to London here. Brilliant! So important to prepare when travelling. Love Wild Food Cafe! I think you should visit Brighton next. Neale’s yard also has an amazing cheese shop with unpasteurised cheeses which are much better tolerated.